ONE can indulge in ice cream when it is made with natural ingredients. Gelato ice creams from Stickhouse also contained ingredients imported from Italy, such as Inulin and Carob Bean flour. The treats are also tailored for the health-conscious as they do not have added flavouring, preservatives and colouring. As we stepped into Stickhouse’s kiosk in Sunway Pyramid, we were amazed at the selection of gelatos and sorbets available. Customers can pick their favourite flavour and coat it with a choice of dark, milk or white chocolate dips and sprinkle it with hazelnut, almond or pistachio nuts. All gelatos and sorbets are made fresh every day in the shop’s production area. Gelatos are made using a slower churning method without adding air, which helps to retain their natural flavours. Traditionally, most ice creams are made by “whipping” their ingredients and adding air, which increases the volume of the frozen dessert. By adding air, most of the ingredients’ original and natural flavours are lost. 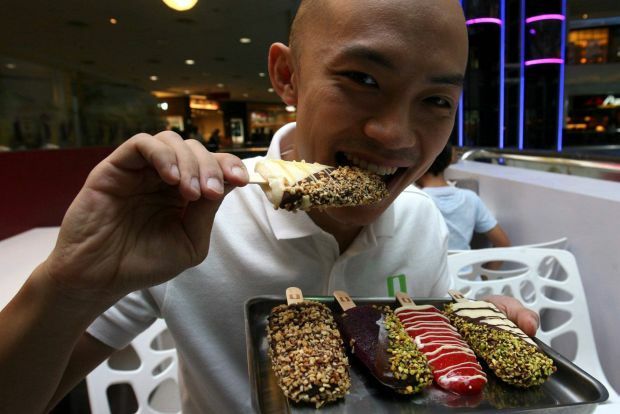 Stickhouse caters to people who are gluten, lactose or sugar-intolerant. The flavours are available in Classic, Premium and Mini for RM6.90, RM8.90 and RM4.90 respectively. Stickhouse also has a kiosk in Citta Mall, Ara Damansara.